The first room we were placed in had water running all over the floor after flushing....yuck! They upgraded us to a king suite but air conditioner was off so room was hot. Finally figured it out the next morning so life was good at that point! Very nice property and polite staff .the room was clean and very comfortable . Where to find Oklahoma City hotels near an airport? How can I find hotels in different Oklahoma City neighborhoods? Where can I find hotels in Oklahoma City that are near tourist attractions? 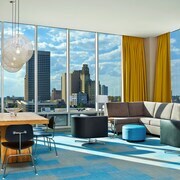 You can discover a variety of room options to choose from in Oklahoma City. About 97 accommodations are within a 0.1-kilometre (0.06-mile) radius from Oklahoma City's center. Among the most centrally located lodgings of downtown Oklahoma City are the Homewood Suites by Hilton Oklahoma City - Bricktown, OK and Residence Inn by Marriott Oklahoma City Downtown/Bricktown. With 3 Expedia-registered accommodation options, Del City is the area with the biggest selection of Oklahoma City accommodations. Del City is 7 kilometres (4 miles) from the center of town. Del City places to stay are the Motel 6 Del City and Candlewood Suites Midwest City. Another popular place to stay is Guthrie. Guthrie offers the Sleep Inn & Suites Guthrie and La Quinta Inn & Suites Guthrie. 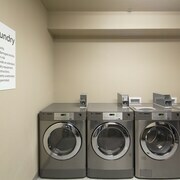 Or, you could try Yukon, where you'll find the Holiday Inn Express & Suites Yukon and Comfort Suites. The Holiday Inn Express Hotel & Suites Edmond and Hampton Inn Oklahoma City/Edmond can be found in Edmond, while Holiday Inn Express Hotel & Suites El Reno and Days Inn El Reno OK are part of the El Reno area. The The Skirvin Hilton Oklahoma City and the Colcord Hotel are situated conveniently near Myriad Botanical Gardens. The Renaissance Oklahoma City Convention Center Hotel and the Hampton Inn & Suites Oklahoma City are near Oklahoma City National Memorial and Museum. The Oklahoma State Capitol and the National Cowboy and Western Heritage Museum are two other much-visited Oklahoma City destinations. The Sheraton Oklahoma City Downtown Hotel and the Medical Inn Motel are within walking distance from the Oklahoma State Capitol. While the Lincoln Inn Express Hotel and Suites and the Park Hill Inn and Suites, are close to the National Cowboy and Western Heritage Museum. Oklahoma City offers a solid selection of economical hotel options that will satisfy budget-minded visitors. The Days Inn El Reno OK is 40 kilometres (26 miles) from downtown, while the Sleep Inn & Suites is 17 kilometres (11 miles) away. Different lower-cost hotels include the Country Inn & Suites By Carlson NW Expressway Oklahoma City and the Isola Bella. The Courtyard by Marriott Oklahoma City Downtown is situated 0.4 kilometres (0.3 miles) away from the heart of Oklahoma City. Another option is the Residence Inn by Marriott Oklahoma City South, which can be found 9 kilometres (5 miles) away. The Embassy Suites Norman - Hotel & Conference Center and the Staybridge Suites Oklahoma City-Quail Springs are two alternative accommodation options worth checking out around Oklahoma City. After you have thoroughly explored Oklahoma City, why not travel a bit further afield? The Central Oklahoma area has plenty of attractions. Central Oklahoma offers prairies. Commonly visited Central Oklahoma visitor sites include history museums. Travelers in this region of United States of America often enjoy horse riding. Looking for more to do? Consider spending a day or two visiting Oklahoma State University and National Wrestling Hall of Fame, in Stillwater, 80 kilometres (51 miles) to the northeast of Oklahoma City. 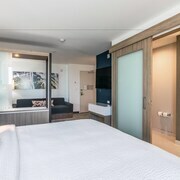 Should you wish to spend a night or two in Stillwater, check Expedia's booking pages for the latest deals at the Holiday Inn Stillwater - University West and Residence Inn by Marriott Stillwater. Or, you could stay in Nichols Hills, 9 kilometres (5 miles) to the northwest of Oklahoma City, where you'll find the Renaissance Waterford Oklahoma City Hotel and Courtyard by Marriott Oklahoma City Northwest. The Western Avenue and Coronado Square are just some of the more popular sites to see when you're in Nichols Hills. Will Rogers World Airport is a nearby airport for arriving in Oklahoma City. It is 11 kilometres (7 miles) away. If you would like to stay nearby, try the Quality Inn Oklahoma City Airport or Knights Inn Oklahoma City Southwest. What are the most popular Oklahoma City hotels? Are there hotels in other cities near Oklahoma City? 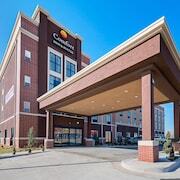 What other types of accommodations are available in Oklahoma City? Explore Oklahoma City with Expedia.ca’s Travel Guides to find the best flights, cars, holiday packages and more!